Last night Reggie Fils-Aime, President of Nintendo America, stopped by The Tonight Show to show off Nintendo's new game Super Mario Run, but also to show off the highly anticipated Nintendo Switch! We are so excited for the Switch to be released this March. 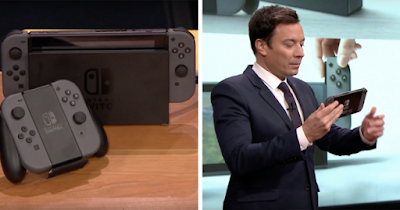 Check out the video below of Jimmy Fallon playing "Zelda: Breath of the Wild" on the Nintendo Switch. Stay tuned for more updates on the Nintendo Switch and Super Mario Run! Spider-Man: Homecoming Trailer is here! Jimmy Kimmel to host the 2017 Oscars!